As organisers, we tend to warmly welcome sponsors, those who can demonstrate, erect displays, entertain and other activity providers which increase the dwell - and therefore spend, time at our events. We like to entice them with a 'special rate', 'price' or discount. We have THREE methods of discounting (special rate, promotion) available! Discounts are ONLY applied either upon full payment up front once approved, OR on the approved exhibitors balance due payment if they opt to use your deposit scheme at the time of applying. Regardless of the discount, Exhibitors/­Participants in whatever guise, will still need to register, complete their profile, and upload all their required documents so we can process their fee and apply your discount. Just direct them to our Exhibitor User Guide. You can give them a discount through your dashboard, before you approve them or before they pay their balance due if they paid a deposit. The Exhibitor selects their stand packages, applies as normal and enters their card details. No card is processed before you accept them purely because this option is available to you. 100% discounts cannot be applied without web administrator assistance. 5. You simply set their discount EITHER in £ or % in the relevant box and click Save. THEN click Approve and the system will take the discount off during the card processing stage. If a deposit is being offered, the discount is ONLY applied when their balance due payment is being taken off their card. i. a FULL payment, follow option 3 below. ii. a deposit that was made, and the balance due is still outstanding, the discount can be applied to the balance due. 7. 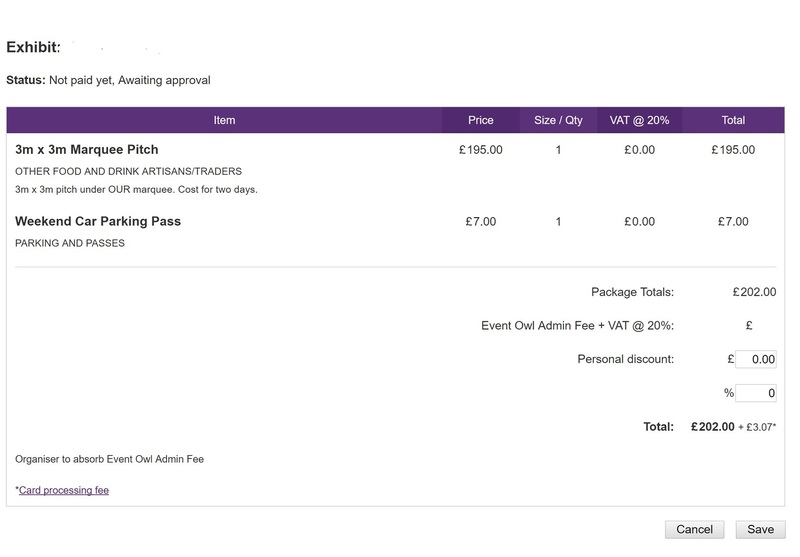 Both your own and your exhibitors sales receipts and dashboard spreadsheets will show the discount applied in the Discount column. The above is most suited to those needing a special price facility for certain, but the discount is not for all exhibitors. 2. 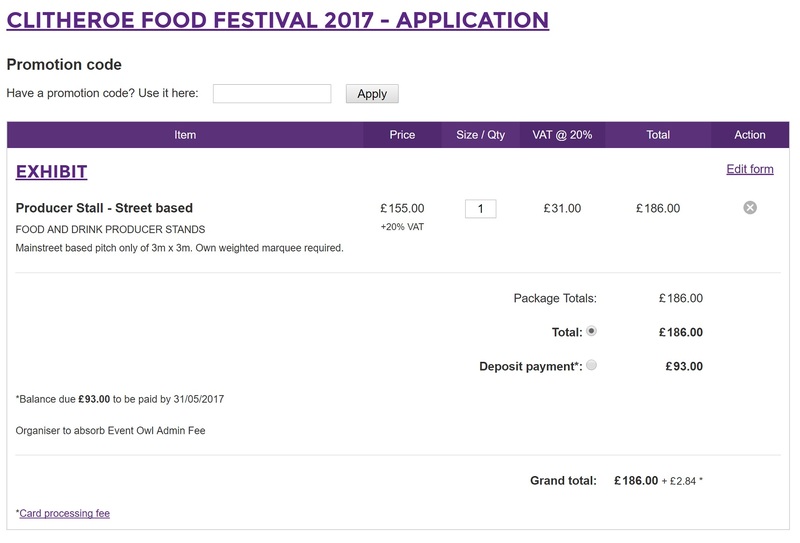 Set the discount either (using the drop down menu) as % or £ and in the box adjacent type the discount amount, and the dates required to/from. 3. Give this code to your exhibitor/­s.­ At check out they are asked, at the top of their order, for a promotion code. They need to enter the code, click Apply next to the box. The 'discount' is taken off their total.­ This cannot be applied ret­ros­pec­ti­vely, they would need to Withdraw their application or you can use #1 above to apply a discount if applicable. The above is most suited to a general early bird offer for any exhibitor, or where a previous years exhibitor discount is needed for encouragement. You can add these one at a time AFTER you go live if needed. If you forget, or if it’s an afterthought, you can always refund them, just email us so its all above board, and we can orchestrate this for you. We can as a last resort create a new package, if you've gone live with bookings, purposefully for that exhibitor. 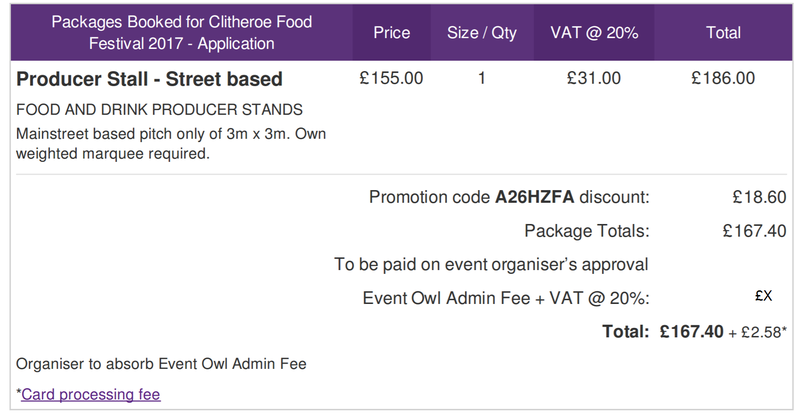 However, the drawback is that this allows any other exhibitor applying whilst that package is up, to see the price of that particular stand. So we advise using a promotion code/discount wherever feasible.